Dűnya dinlemiyor is Turkish for The World Won’t Listen, which as you may know is a 1987 compilation album by The Smiths. At the time of release, the world was listening. The album was a chart hit. And that was just in the UK. As this work by artist Phil Collins reveals, the sentiment and the message of the album reverberated all the way from Columbia to Indonesia via Turkey. The Turkish installation of this epic project was filmed over several days in an Istanbul nightclub, to which fans of The Smiths were invited to sing along with a karaoke backing to the 18 track album. Thanks to the efforts of these volunteers, 30 years on, the audience for this work will be able to listen more closely to an album which Morrissey appeared to predict the world would ignore. He was loved him all the more for it. And his imitable persona has made the 2,000 mile journey from Manchester for this hour long film. A local, for example, performs with a back pocketful of flowers. More interesting than the inevitable Moz impersonators, are the millennials who take part in this exercise with good cheer. There Is A Light That Never Goes is joyous, rather than maudlin. In a similar vein, we have a hard rocking version of London and a version of Half A Person which is equally good for a giggle. It’s comedic to be a Turk singing about Euston station or the YWCA. When it’s not being funny or being awkward, dűnya dinlemiyor is a moving reprisal of a collection of songs that take one back to the 1980s, via this highly circuitous cultural route. The singer is a middle aged goth who gives her all to the final performance of this artwork. Either she can’t let go of the music of The Smiths, or she has moved on and felt the consequences. This work can be seen in Now, Today, Tomorrow and Always at Towner, Eastbourne, until October 8 2017. The show is an Arts Council Collection National Partner Exhibition. The less seriously he takes himself, the more his audience appear willing to suspend disbelief. This – it seems to me – is the peculiar genius of artist, and sometime shaman, Marcus Coates. His East London gallery is currently showing a four-year-old film in which he visits ‘ordinary’ people in their homes or workplaces and, prompted by a question they’ve prepared, dances for them. No music comes between the artist and his private audience. Coates will remove his glasses, as if to put a check on his intellect. But this is his only concession to costume. He takes the locations as he finds them. There are unwashed dishes in the kitchen and discarded beer cans in the bedroom. There is an everyday drabness about the office. And no matter how comic you might find in the notion of answering questions through the medium of contemporary dance, Coates plays these performances quite straight. The only comedy comes within the terms of the dance, as he flings himself on the floor, stampedes on the bed, convulses on the carpet, headstands against the kitchen counter. His audience don’t laugh and neither do we laugh at them. It is to their unending credit that they take this project seriously and express their reactions and insights with great respect. And so Coates and collaborator Henry Montes (a dancer who has presumably coached the artist) bring out the best in their audience and demonstrate how open minded people can be. There is a sense that this experience has been at worst merely interesting and at best genuinely useful to the three participants, who face problems ranging from distractibility to indecision. Coates reminds us that dance is a primal activity. But there is a quietness to the way he presents it here, which implies that putting on a wild improvisation is the most natural thing in the world. A Question of Movement was commissioned by Siobhan Davies Dance and can be seen at Kate MacGarry, London, until 24 October 2015. To be fair, all years have some groundbreaking music to recommend them. But 1975 was a good year for both jazz and urban planning in Germany. Who knew the two could go together? In Köln, Keith Jarrett played an improvised concert, the recording of which was to become the best-selling solo piano album of all time. Note the quibbling over genre, which can be found elsewhere. Meanwhile to the North West of the city, a communal reform pronounced 12 nearby villages to have become a single municipal entity. Pulheim was born and in 1981 became a city. 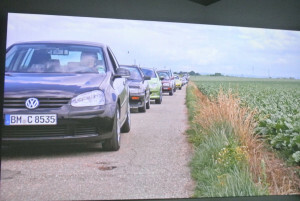 Now, thanks to a new 23 minute film by Swedish artist Billing, improvisation and infrastructure have been married up again: a pianist plays in a barn, while 50 cars stage a tailback on a one-lane road. Applying herself to the baby grand is artist and musician Edda Magnason. She offers a soundtrack to the traffic situation which begins with some tentative vamping and builds to an insistent riff. The camera loves her instrument, the workings of which are juxtaposed with the engines of the cars, as, when the queue gets moving again, one driver helps another with a jump start. But this is one jam you might not want to end, even if it takes place in a landscape as monotonous as it is continental, with fields of sleeping corn and power lines hung like staves from pylons. It is only once the cars grind to a halt that their occupants come to life. Passengers play with dice. A father reads to his children. Dogs are let out to chase sticks. It’s all action in a major key. Back in the barn, we encounter film crew, lighting rig and the impossible sight of men loading the Bechstein onto a removal truck belonging to ‘Piano Express’. Easy on the ears, the music plays on. 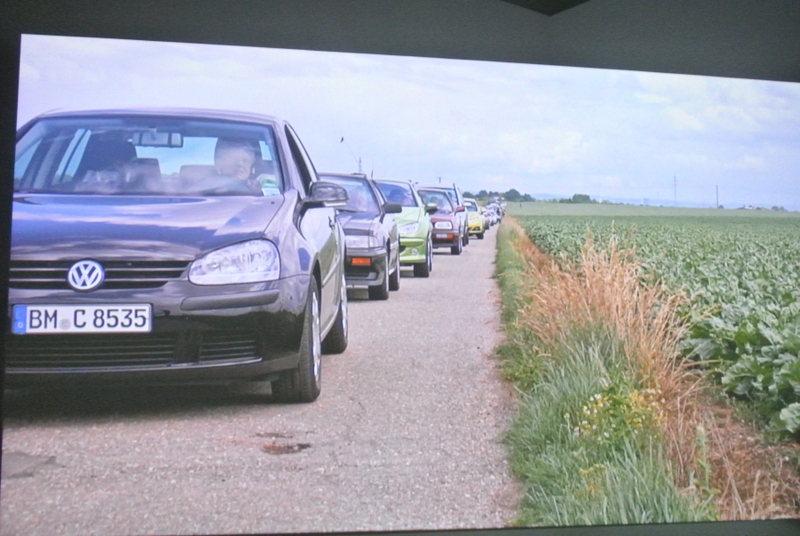 Plenty more sounds find their way in; the road users provide ambient noise. And Magnason takes regular breaks, allowing you to think about what you see just as much as what you hear. But ultimately, if you give it time, this film will sweep you away. It is at once totally mundane and yet life-affirming. Billing finds music in every visual detail, from smokestacks to litter in the kerb. Pulheim Jam Session enjoys its premiere at Hollybush Gardens, London, until 25 April. Read my 2009 interview with the artist here.